Happy Mardi Gras! How are you spending Fat Tuesday? 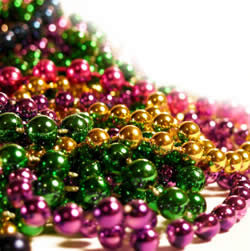 I'm thinking back to a couple of Mardi Gras parties I've been to in the past, one of which my mom slaved away in the kitchen all day preparing King Cake, jambalaya and other awesomely festive goodies! Hmm, perhaps I'll also try to recreate the Gumbo Crepes that I had in New Orleans Square at Disneyland on Valentine's Day. Yum! Thankyou so much for you visit on my blog and kind comment! I had a King Cake Free Mardi Gras. :) With all the craziness in my town over here...I had an amazing week and a great Tuesday!!!! :) They don't call it Mardi Gras here but it's pretty much the same thing just a bit different. ;) Haha. Happy Mardi Gras! I love jambalaya! And the colours, and the beads! I have to admit I don't really celebrate it myself, but I love to watch! I like, live vicariously through those who do celebrate it, LOL. I attended a Mardi Gras party last weekend and has a blast! Gumbo, king's cake, and bread pudding.